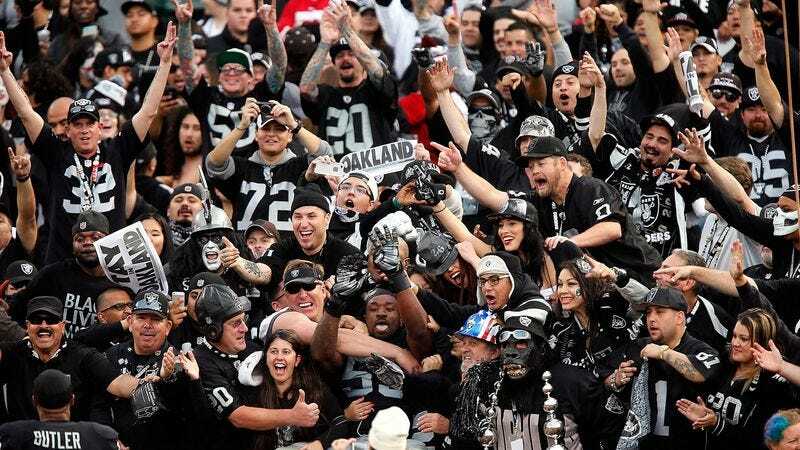 OAKLAND, CA—In an effort to retain loyal supporters during the NFL franchise’s move to Las Vegas, officials from the Oakland Raiders organization announced Wednesday they had reached a deal to pay their fan base nearly $16 billion in relocation expenses. “As a demonstration of their value to this franchise, we have offered all our fans a generous compensation package for the costs associated with their transfer to Las Vegas,” said team president Marc Badain, adding that each of the team’s 52,000 season ticket holders and nearly 400,000 other qualifying residents of the Oakland area would receive up to $35,000 apiece for eligible expenses such as real estate commissions and closing costs, the hiring of movers, and expenditures incurred during their new job search. “We hope all our incredible hometown fans will take advantage of this funding to make the move as painless and hassle-free as possible. We sincerely look forward to Raider Nation joining us in Las Vegas.” Sources within the organization confirmed that the relocation package would be subsidized by a new amusement tax levied on those who remained in the city of Oakland.